A look at what’s happening across the Ontario Hockey League this week. The 100th episode of the Rogers Hometown Hockey Tour will be in London this coming weekend, going back to the place where it all started. This weekend’s coverage features stories covering the London Knights and homegrown talent in OHL graduates Brandon Prust and Hall of Famer Eric Lindros. Don’t miss this weekend’s festivities, visit hometownhockey.com for full details. While visiting hometownhockey.com be sure to check out highlights from last weekend’s trip to Parry Sound, home of the legendary Bobby Orr, that also featured a more recent local hero in Owen Sound Attack forward Aidan Dudas who joined Ron MacLean and Tara Slone on the broadcast. Knights jersey auction raises money for London hospitals: The London Knights are auctioning off their specially-themed game worn jerseys from Friday’s 7-6 overtime win over the Sarnia Sting. All proceeds will go to benefit London hospitals through the London Dream Lottery. A wide range of jerseys are available at auction.chl.ca. Battalion host Pink in the Rink Night on Thursday: The North Bay Battalion will be decked out in pink this Thursday when the Mississauga Steelheads visit the Memorial Gardens. The Troops are holding Breast Cancer Awareness Night and invite fans to wear pink on Thursday. For more details visit battalionhockey.com. Spitfires celebrate 10 years at the WFCU Centre on Thursday: The City of Windsor is hosting a celebration marking 10 years since the WFCU Centre’s Community Side opened its doors back in 2008. To mark the occasion, the Spits are offering a limited number of $10 Red Zone tickets and there will be special $10 offers at the facility’s concessions for Thursday’s game against the Barrie Colts. For more details visit windsorspitfires.com. Country Night in Saginaw on Friday: The Saginaw Spirit host Country Night at The Dow Event Center on Friday. Fans are encouraged to arrive early for pre-game festivities starting at 5:30pm. Don’t miss out on the mechanical bull! 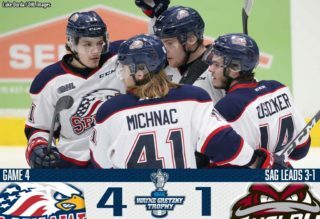 Full details at saginawspirit.com. IceDogs suit up as Superheroes on Friday: The Niagara IceDogs are dressing up as superheroes on Friday, hosting Superhero Night at home to the Windsor Spitfires. The Dogs are playing in support of Family and Children’s Services Niagara, auctioning off their specially themed jerseys post-game with proceeds going to the charity. For more details on Friday’s initiative, visit niagaraicedogs.net. First Responders Night in Sarnia on Friday: The Sarnia Sting pay tribute to first responders on Friday when they play host to the Owen Sound Attack. The Sting will be honouring the Sarnia Fire Department, Lambton EMS, Sarnia Police Services as well as Canadian Border Security. Storm host annual Food Drive on Sunday: The Guelph Storm will be collecting non-perishable food items on Sunday when they play host to the Kitchener Rangers. Last year with all that was collected, along with some cash donations over 1,700 meals were provided for the Guelph Food Bank. More information at guelphstorm.com. Senators remember Ray Emery: The Ottawa Senators paid tribute to the late Ray Emery on Monday night, bringing former teammate and fellow OHL grad Jason Spezza of the Dallas Stars to tears on the bench. Fans and players alike were moved by the tribute video, which highlighted Emery’s 11 seasons in the NHL, including helping lead the Senators to the 2007 Stanley Cup Final. Emery, who passed away this past July at the age of 35, played three OHL seasons with the Sault Ste. Marie Greyhounds from 1999-2002. Canadian singer and Emery’s former fiancée Keshia Chante performed the anthems wearing his jersey. Svechnikov has been everything Canes hoped for: 2018 OHL Rookie of the Year Andrei Svechnikov is making a smooth transition into the NHL. The Barrie Colts graduate has two goals, both game winners, along with two assists thus far, pitching in on the Carolina attack. Playing alongside WHL grad Jordan Martinook and Swedish forward Lucas Wallmark, Svechnikov is getting accustomed to life in the NHL. NHL.com’s Mike Morreale has the story. Kahun scores first NHL goal: Sudbury Wolves graduate Dominik Kahun scored his first career NHL goal last week. The Chicago Blackhawks forward found the back of the net against the Minnesota Wild and currently has four points (1-3–4) over five games. The 23-year-old native of Plana, Czech Republic played two seasons in Sudbury from 2012-14. He spent the past four seasons playing in the European professional ranks, most recently with the DEL’s Munich EHC. Culina signs ECHL contract with Newfoundland: Kitchener Rangers graduate Mario Culina is set to join the ECHL’s Newfoundland Growlers. Culina comes off a four-year OHL career spent between Windsor, Sudbury and Kitchener. 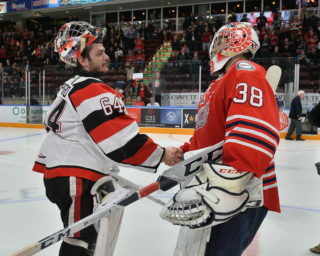 The former Memorial Cup champion helped the Rangers reach the Western Conference Final last spring, registering a 2.79 goals-against average and .917 save percentage in 19 playoff games. The 21-year-old native of Sault Ste. Marie, Ont. joins the Growlers in their first year of existence. Fox to suit up at University of Windsor: Mississauga Steelheads graduate Trent Fox will play for the University of Windsor Lancers Men’s Hockey team this season. The 21-year-old from Chatham, Ont. 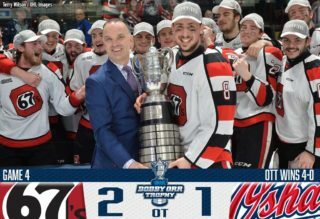 comes off a 53-point (24-29–53) season in Mississauga last year, wrapping up a 255-game OHL career between Erie, Belleville, Hamilton and Mississauga. Fox helped the Steelheads win an Eastern Conference title in 2017. Two teams projected to be highly competitive this season square off in St. Catharines on Thursday as the Ottawa 67’s visit the Niagara IceDogs on a five-game winning streak. 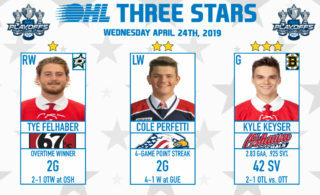 The Barber Poles are the eighth ranked team in the Canadian Hockey League this week and feature the high-scoring duo of Austen Keating (3-16–19) and Tye Felhaber (11-7–18). The IceDogs try and bounce back from a Wednesday night loss in Erie, looking for continued production from Los Angeles Kings prospect Akil Thomas (4-14–18) and leading goal-scorer Kirill Maksimov (10-6–16). A rematch of the 2018 Rogers OHL Championship Series goes down in Sault Ste. Marie on Saturday as the host Greyhounds take on the defending league champion Hamilton Bulldogs. The Hounds are off to a strong start in 2018-19 as newly minted captain Barrett Hayton has returned to the lineup to record seven points (4-3–7) through his first four games. Philadelphia Flyers prospect Morgan Frost leads the Hounds offensively with 19 points (6-13–19) through 11 contests while Toronto Maple Leafs draftee Mac Hollowell (3-5–8) has been a force on the blue line. Hamilton most recently took a wild 7-6 shootout win in Owen Sound on Wednesday as 2019 NHL Draft prospect Arthur Kaliyev recorded his first OHL hat-trick. The Bulldogs have now won three straight, with overage veteran Brandon Saigeon (6-14–20) leading the OHL in scoring.